Have you heard of a Bakewell tart? I hadn't until only a few days ago. I was doing my usual marathon through the internet, flipping from one food blog to the next. My final visit was to one of my favorite blogs, Smitten Kitchen. I drooled over her newest post, which was an everyday chocolate loaf cake. I knew it was time to use another of Deb's recipes, as hers always hit the spot. I went into her archives. I immediately felt overwhelmed. How in the world was I supposed to choose? I started jotting down recipes I wanted to make. I simply couldn't help but write down at least every other recipe. Once I had my list, I went back through it in order to choose one recipe to make that night. So many cookies have been popping up here, so the sugar puffs, graham crackers, and grasshopper brownies were out of the question. I had just made Irish soda bread, so that knocked out miniature soft pretzels and braided lemon bread. And my recent attraction to breakfast treats made me think that you'd prefer something a little sweeter than cottage cheese pancakes, granola bars, or boozy baked french toast. A tart, a tart! 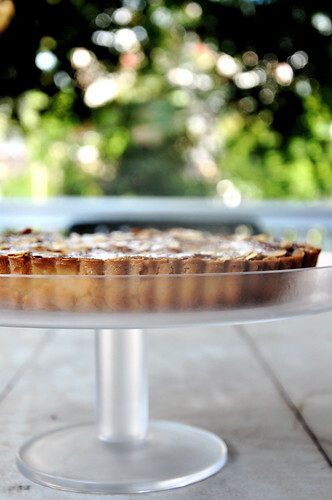 Of course, a tart. 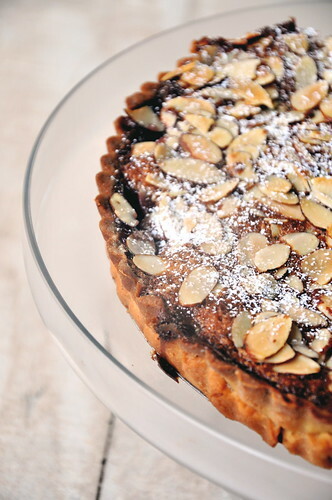 I had not made a tart, at least for the blog, since the end of May when I made the strawberry cornmeal galette. 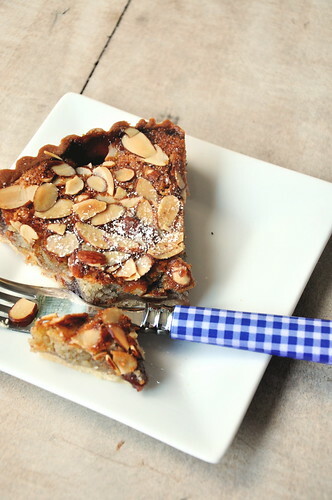 You know how much I love almonds, so the Bakewell tart immediately struck my fancy. It didn't hurt that this is an English dessert. Oh my, I think I forgot to mention that I changed my mind- I am actually going to St. Andrews. Something just didn't feel right about Northwestern, and I am so very happy that I was able to switch. Bakewell tarts originated in Bakewell, a town in Derbyshire. The tart began as more of a pudding, and, like so many tasty things, was created by accident. The cook at the White Horse Inn misread the instructions for a jam tart and ended up with something so much better. Try it for yourself. Trust me. Preheat the oven to 350 degrees. Roll out the tart dough to be slightly larger than the tart pan. Drape over the pan and press into it. Crumple parchment paper, place in the bottom of the unbaked tart shell, and fill with pie weights, dried beans, or rice. Bake for 20 minutes until the dough has baked and is golden brown. Remove and allow to cool. Meanwhile, pulse almonds and flour in a food processor. Add the sugar and pulse to combine. Cut the butter into smaller pieces and drop into the food processor. Add the almond extract and lemon zest and mix until smooth. Add the egg and the egg white and blend until the mixture is smooth. Transfer filling to a plastic bag and freeze until the tart shell has baked and is cool. Spread the jam over the bottom of the pre-baked tart shell. Dollop the chilled almond mixture over the jam. Disperse the mixture using an offset spatula. 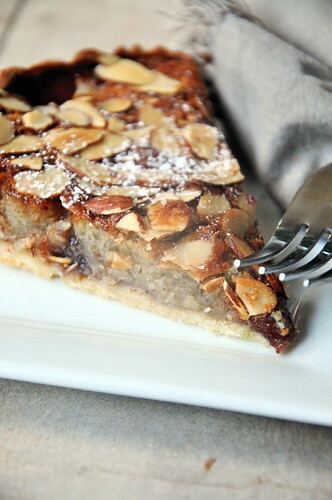 Sprinkle the sliced almonds over the top of the tart. Bake for 45 minutes or until a cake tester inserted in the center comes out clean and the top is golden brown. Cool on a wire rack.